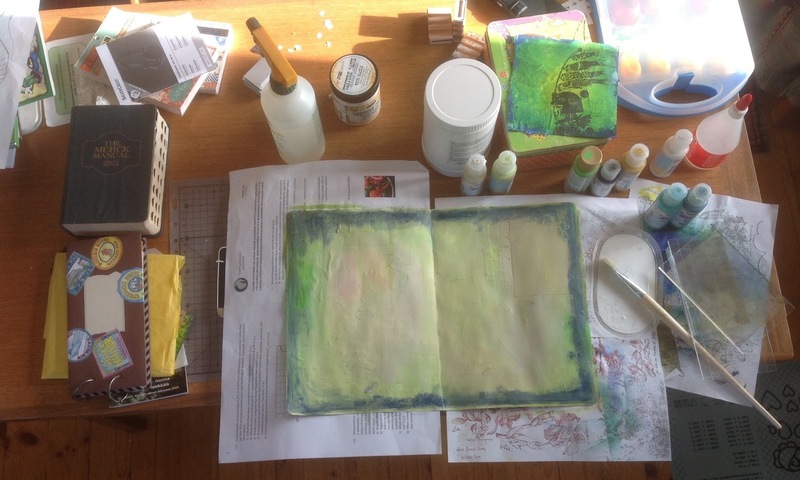 After all sorts of June projects I cleared out my table and started a journal page by gluing down miscellaneous scraps and covering them with a layer of gesso last night. Here it is well on the way, just did a layer of acrylic paint and next I'm going to dig out some stencils and stamps to continue on that. On the left is my blog candy from Lindsay Ostrom. Or part of it, the pile of pens has been put in place, there's a travel journal and something to hang on the wall. The Merck manual is some medic book for "diagnosis and therapy", I took it from the exchange shelf at our library... that is a shelf where anyone can leave/take books, no need to return them. Well, I don't need more books to alter, but I'm storing that somewhere. On the other side of the table my son has been decorating matchboxes. The orange/green tin holds my gel pens (out for shrink plastic) and on top of the box is a problematic project, the stamping got all smudged when it dried. There's a layer of clear gesso on it, and I believe that's what dispersed the ink, I'm wondering if I should cover it or live with it. Wondering what this WOYWW is all about? Hop to the Stamping Ground blog to find out more and visit desks from all over the world! Oh that looks fabulous - at least you remember scrap paper I always end up scraping paint off my desk (or dining table whoops). How wonderful that your son can craft alongside you at your desk! His matchboxes are great. I'm sorry about your problem project. That is disappointing. Perhaps you should leave it for a while and then completely re-think the whole thing.